It's called the Bus Stop Challenge. At least, that's what I call it, and as I don't know anyone else daft enough to have had the idea, it seems as good a name as any. The idea is you find a queue at any bus stop - in most countries that's no challenge at all, even if finding a bus stop is becoming increasingly difficult in some areas - and ask everyone in it whether they have any contact with - direct or indirect - Western Classical Music. You might find a man with a grey mop of tousled hair who tells you he conducts the London Symphony Orchestra, or a bald headed septuagenarian who tells you he is kept awake at night by the young man upstairs practising his drums for his next drumming exam. But both count as having a relationship with Western Classical Music. The challenge is actually going up to these strangers and posing the question. It's certainly a challenge too far for me - I did it once when I was so seriously under the influence of alcohol that I can't really remember the responses I got - but a number of my students (who are more courageous than I) have accepted the challenge and their results have been staggering. This is by no means a legitimate scientific study, but while my London students reported about 1 person in 25 picked at random from a bus queue acknowledged the relationship, in Singapore the figure in Singapore is 2 in 5. In Singapore Western Classical Music has seeped into everyday society to an extent which I find astonishing. Partly that is the active involvement of the government, but even more so it is the emphasis so many Asian parents put on music as an important skill in the development of their children. The fact, also, that Singapore presents a disproportionate number of its young people to the graded exams administered by the three London-based exam boards - cumulatively, around 10% of all candidates world wide are in Singapore - adds to this; indeed, students report that a majority of those approached at bus stops relate to Western Classical Music through a relative or neighbour doing an exam. 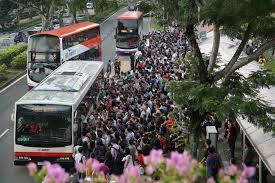 We might also consider that in Singapore travel by bus covered a wider social range than in, say, the UK. Certainly it seems that Western Classical Music has a firm foothold in Singapore Society. The question is, however, whether that is to the advantage of either or both. Just because people know about something, does not mean they either care about it or even appreciate it. I have a suspicion that we are not doing enough to nurture this relationship and transform it into a positive thing; at the moment we still seem obsessed with the idea that it is a minority interest and are working to change that when in fact this seems to indicate it is far from being any such thing. If you ever have the courage, please do the Bus Stop Challenge and let me know what you find. I can't compensate for black eyes and broken noses when the wrong sort of person is approached at the bus stop, but I can offer my sympathy and a soothing piece of music to ease the pain.